What has impressed everybody that has come into contact with the island of Crete and its rich history, either as a visitor to the island, or a student of history or even an occupier of the island, as the Venetians were during those 450 years, has been their fighting spirit and their willingness to endure unbelievable hardship in order to defend what they cherish most and that is freedom and honour. And they have fought not only in Crete but also in other lands defending the freedom and honour of other people who were similarly oppressed by the enemies of Orthodoxy. One such historic event occurred during the Venetian rule era when Cretans went to the assistance of the Byzantine Emperor to defend Constantinople during its last few days in 1453. 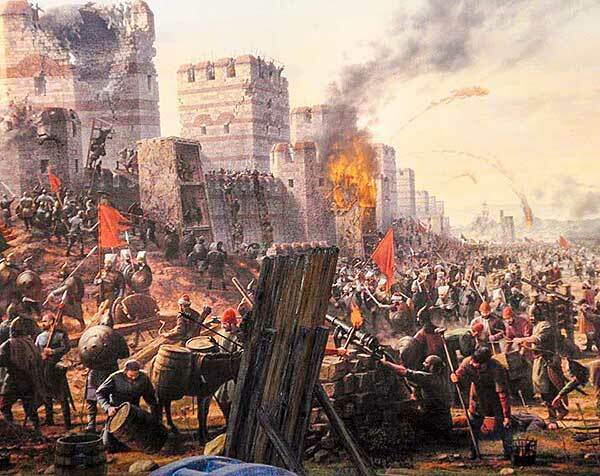 In January 1453 Sultan Mehmed II who by then had surrounded Constantinople decided that he was going to attempt to take it over, either by breaking through its defences or by starving it into submission. He had the troops, he now had also an enormous fleet at his disposal and while the besieged Byzantines and their Christian allies were demoralized and divided amongst themselves he believed that now was his opportunity to take over the city and end the long and glorious history of the Byzantine Empire. Responding to a request for help from the Byzantine Emperor, the Sfakian leader Manousos Kallikratis gathered 300 Sfakian warriors and an other 760 Cretans from other parts of the island and sailed in 5 ships, of which 3 were Sfakian, to the aid of the besieged Emperor. They fought valiantly by breaking through the Ottoman blockade and later on defending the city. Many Cretans died alongside the Byzantines and the few Genoese and Venetian co-defenders. When the city fell the only 170 surviving Cretans had been surrounded by Ottoman troops in one of the city's towers and were refusing to surrender. The Sultan was so impressed by their courage and fierce fighting skills that he agreed to let them walk out of the city with their flags, arms and wounded and sail away to Crete in one of their ships. A poet of the time has the Emperor saying as he is surrounded by the Ottomans "Christians, Greeks, cut off my head, take it, good Cretans, and carry it to Crete, for the Cretans to see it and be sad at heart". Just a few words from an anonymous poet describe the deep impact that the fall of Byzantium had on the Cretans. They were to become the next home of the refugees from Byzantium and responsible for nurturing the rich heritage left to them by the collapsing Byzantine Empire. The never ending cycle of new and ever increasing level of taxes, uprisings and their brutal suppression, as well as the provision of compulsory labour were not the only hardships that the population had to endure during this period. The plague hit Crete many more times than Europe suffered during this period, with thousands dying during any one of those epidemics and on occasions whole villages were wiped out. Earthquakes have hit Crete since the very early days of known history, and this phenomenon continued during the Venetian era, again destroying towns and villages, killing many. And seasonal crop failures added to the hardship and misery of the population who starved and died of famine in their thousands at times. In addition to the hardship of the Venetian rule and the above mentioned natural disasters, the population had also to endure regular pirate raids along the coastline. And these pirates were many: Arabs from the North of Africa, Turks from Asia Minor, Christians from Malta, Genoa, Spain, France, as well as Greeks from the Aegean islands and Peloponnese. And some of these pirate raids were fearsome in scale and impact. One of the most fearsome of that time was Barbarossa, who raided the area with no less than a fleet of eighty ships, attacked large fortified towns like Candia, Rethymno and Chania and succeeded in taking over Siteia, plundered whole areas of the island and capture thousands of Cretans whom he sold to the slave markets of the East. The first two centuries of Venetian occupation were characterised by continuous conflict between Venetian rule and Venetian nobles on the one hand and Cretan noble families and the heavily taxed Cretan Orthodox population on the other hand. The only heritage of that era are the many fortified castles built by the Venetians, and the Catholic churches, many of which did not survive the subsequent vandalism of Ottomans, Cretans and bombardments during the second World War. The Cretans themselves also went on building hundreds of small churches throughout the countryside, many of them decorated inside with magnificent frescoes. Unfortunately many of these frescoes did not survive the vandalism of the Ottomans and the Muslim convert Cretans, and also the passage of time and the good meaning intentions of the local peasantry, that whitewashed them over when their condition deteriorated. By the 15th century the island started experiencing the hellenisation of the Venetian nobles and their adoption of the Greek language and through intermarriage of Venetians and Cretan noble families the emergence of a new culture. This had characteristics of both Western culture and some of the Byzantine heritage that Cretans had maintained and refugees from Byzantium had brought to Crete. And following the Kantanoleon revolution in 1527 which was the last large revolution that the island experienced, the island started experiencing a cultural renaissance. Painting as an art existed early in the Venetian rule period in the form of frescoes and icons in a very advanced form and as the exodus from Byzantium started, Crete drew a number of painters from Constantinople who added to the level of skill and style that was already there. Western Renaissance soon started influencing the style of painting on the island, fusing in some way the styles and creating a distinctly different Cretan school of painting. Many Cretan painters started moving to the West, the most famous one being Domenikos Theotokopoulos, known as El Greco. And an other feature of that period of cultural renaissance which is still in evidence today in Crete's major towns are the impressive buildings built on the style of Venetian palaces and the fountains and other monuments that survived the bombardments by the besieging Ottomans, and during World War II. Erotokritos is a romantic poem considered to be a masterpiece of Greek Renaissance poetry, consisting of 10,000 fifteen syllable rhyming lines, that has captivated generations of Greeks, from illiterate shepherds to eminent Greek poets such as George Seferis. It is an epic story of love, romance, conflict, exile, dedication to one's country, and finally through bravery good defeats evil and love is fulfilled. It reflects a Crete considerably changed through the influence of the West with its romantic notions of chivalry and the romanticism that troubadours were spreading throughout the West. The poem was written by Vintsenzos Cornaros, a Cretan most probably of Venetian descent who was born in Sitea either in the late 1500's or very early in the 1600's. He must have written the poem in the last few years of the Venetian rule and copies of his manuscript taken off the island by escaping Cretans, many of whom fled to the Ionian islands off the western coast of Greece which were then occupied by the Venetians at that time. The first known manuscript that is in existence today was produced in either Kefalonia or Zaknithos and is dated 1710 while the first printed edition was produced in Venice in 1713. 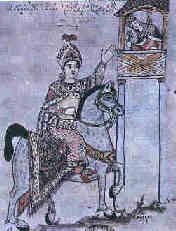 Since then the poem was circulating amongst the Greek people in Ottoman occupied lands and captured their imagination as they dreamed of their national aspirations being fulfilled when Erotokritos helps the Athenians defeat the Vlahs and then kills the nephew of the king of Vlahs in a duel and as a reward he is allowed to marry Aretousa. Generations of Greeks and especially Cretans have been reciting large parts of the epic poem and there have been quite a few who have managed to memorize the whole 10,000 lines of it. 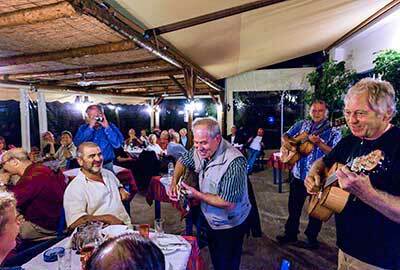 Parts of the poem have also been recorded by famous Cretan musicians and sections of it regularly feature in new album releases. Following the death of Sultan Suleiman I in 1566 the Ottoman Empire entered a period of decline due to a number of problems associated with succession, corruption in administration, changes in the military structure and the role of the janissaries, and economic stagnation while the West was undergoing a commercial revolution at the same time. The successor to Suleiman, Selim II decided in 1570 to take Cyprus from the Venetians and invaded the island in July 1570. The Venetians sought assistance from the Christian states but none was forthcoming, so they requested the assistance of Pope Pius V who put together the Holy League, an alliance of Spain, Venice and the Papal state. An armada of boats of the Holy League succeeded in humiliating the Ottoman fleet in October 1571 at the Gulf of Lepanto, but it was too late to save Cyprus which had surrendered earlier that year. In the following few decades both the Ottoman Empire and Venice were to experience setbacks and see their respective military and economic powers in decline. And at the same time the other Christian states were experiencing their own problems with the decline of the Hapsburgs, the increasing influence of the Russians and the religious upheavals resulting out of the Reformation and the influence of Protestants, Calvinists and Lutherans. An event that took place in 1644 was to give Sultan Ibrahim I the opportunity to attack Venice's last bastion in the Eastern Mediterranean, Crete. An Ottoman galleon, traveling in a convoy towards Egypt and carrying pilgrims to Mecca was attacked by Maltese pirates. Amongst the captives was one of the Sultans wives and her son. (The exact relationship to the Sultan is disputed amongst historians) The Maltese on their return trip had stopped at Crete and that gave the Sultan the pretext to attack Crete rather than Malta which was better defended and which the Ottoman fleet had failed to capture a century earlier. A fleet of more than 400 ships carrying an army of 50,000 men managed to surprise the Venetians who were unprepared for the invasion. The invaders landed west of Chania on 23 June 1645 and soon reached Chania and started the bombardment of the city. The Venetians attempted to mobilize Cretans from nearby districts but they were not very effective. Many of the peasants were seeing the Ottomans as liberators from the Venetian oppression rather than as invaders. But on the other hand many Orthodox clerics would put up a heroic defense of their monasteries against the Muslim threat to their religious beliefs. The besieged Venetian troops eventually surrendered on 22 August 1645 after a two month siege that saw hundreds killed The town was looted and its citizens that remained in town were arrested and sold as slaves. By the time Chania had surrendered the rest of Western Crete had already been occupied by the invaders. A new Ottoman force of 40,000 had earlier arrived at Suda bay and they headed towards Rethymno. The siege of Rethymno lasted again two months and the number of dead was very high. Eventually the Venetians agreed to surrender the town and its inhabitants were allowed to leave for Candia or the Ionian islands on Venetian ships. In the meanwhile the countryside was being taken over by the Ottoman troops who left Candia itself as a last target as they were expecting the town to be well defended and its capture to take quite some time. In the countryside the Ottomans experienced some resistance from some Cretans who were being encouraged to resist by Orthodox church leaders, but this did not stop the eventual take over of the whole island with the exception of Candia and three other fortified castles. The siege of Candia started in May 1648 and was to last for just over 20 years! The Ottomans were in full control of the land side but the Venetians were able to get regular assistance from the sea side. Bombardment of the defenses was to continue daily and regular attacks against the walls took place. But the Venetians continued to receive outside assistance and support from their own fleet. Their fleet had the benefit of technological advances as they started using sailing ships rather than oar propelled galleys, being faster, more maneuverable and carrying heavier armament without the need to accommodate the hundreds of oarsmen. The Ottomans were slow in adapting to this new innovation and this was demonstrated in the defeat of their fleet by the Venetians at the Dardanelles in 1658. The European states started taking interest in the events in Crete and were concerned about the capture of Crete and the resulting control of Eastern Mediterranean by the Ottomans. Eventually they started responding to Venice's requests for assistance, and Spain initially responded with financial and naval assistance, followed by France in 1660 sending 4,000 men. In the next few years and up to the eventual surrender of Candia, assistance was received from Rome, Hanover, Germany and the largest force again from France with 6, 000 men. The Ottomans determined to finish the siege also send an additional force of 40,000 soldiers in early 1667. Disagreement between the Venetians and the French saw the French together with other volunteers from Germany sailing away and leaving Francesco Morosini with a force of about 4,000 men to defend the town alone. The conditions within the town had deteriorated to such an extent that the Venetian commander Francesco Morosini commenced negotiations for the surrender of the town. Once agreement was reached, the last surviving Venetian troops and the few remaining citizens left Candia on Venetian boats on the 27 September 1669. The twenty year siege saw the town of Candia substantially destroyed, 31,000 Venetians and other defenders loosing their lives while more than 137,000 Ottomans were killed. The impact on the Cretan population in terms of people killed and people fleeing to exile has never been accounted for. 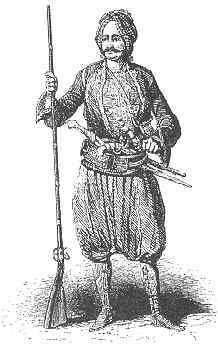 In 1645, 60,000 Turks led by Yussut Pasha disembarked on Crete and occupied Chania and Rethimno. After an unbelievable 21-year siege, Chandax, the last fort of resistance, was surrendered by Francesco Morozini to Turk Ahmed Kioproulis, in September 27th, 1669. Thus, Crete came under Turkish occupation. This period is characterized by destruction, raids, and property confiscation, which were now handled by the Sultan and the persecution of the local Christians, despite the privileges that Mohammed B had granted the Patriarchy. Most of the churches were turned to mosques and the locals were either massacred or imprisoned. The Cretans did not leave the island, in spite of the conditions of poverty and pressure, and resisted in every possible way. In 1692, they fought together with the Venetians against the Turks, a fact that irritated the enemy and resulted in the massacre of many Christians. Another attempt at independence with the help of the Russians in 1770, ended in bloodshed. Yet, the Brave Cretans did not quit the struggle. The biggest part of the island was liberated in 1821-1824. Unfortunately, Egyptian Ahmet Alli came to the aid of the Sultan before all of Crete was liberated. After the declaration of the Greek state, the circumstances allowed the Sultan to give Crete away to Egypt until 1840, when the extensive riots forced Egypt to grant privileges to the locals. 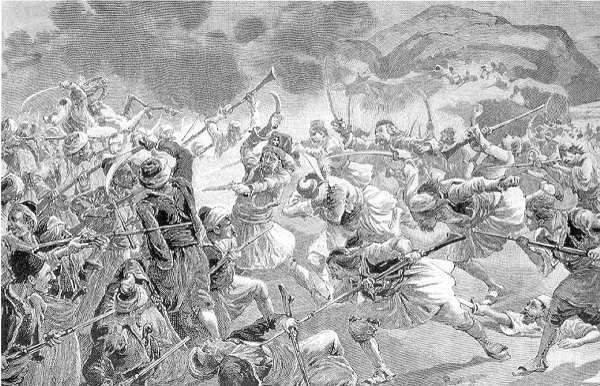 This irritated the Turks and a series of battles began, the most important of them being the Revolution of 1895-96, the battle of Crete in 1866-68 and the holocaust of the monastery of Arkadi. The sacrifice at Arkadi was not a dream. The Cretans there really did gather in the gunpowder room, and when the Turks closed in, ignited the powder, killing themselves as well as the Turks. They did this because death was a far better alternative than being captured by the ruthless and barbaric enemy. Moving forward in time to about 1400 AD we find the Turks (Ottoman Empire) invading and occupying Greece for a period of about 400 years. This occupation was one of the worst ever in history. The Turks brutally raped, tortured and killed thousands of Greeks. 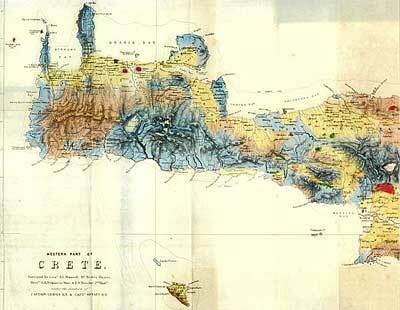 Even after March 25th 1821 when mainland Greece was liberated, Crete was still under Ottoman rule. But through sacrifices like those at the Arkadi, Crete too was soon liberated from the Turkish infestation. Crete was a very unique case in the course of the occupation. Due to the island's rough and mountainous, yet beautiful terrain, many places were inaccessible to the Turks who did not know the land. Even when the Venetians had invaded Greece, they did not go to occupy Crete because they knew that they would be at a great disadvantage against the islanders who knew the land like the back of their hands. Thus, Crete was a major center from the liberation movement. 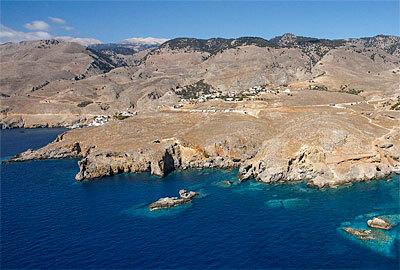 Of major importance was the area of Hania known as Sfakia. The following are passages from a folk song. 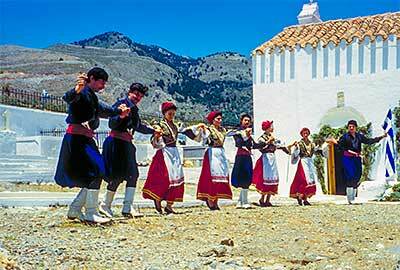 It is through song that the Cretans preserved much of the history of the times. The passage expresses not only the desire to defeat the barbaric tyrants, but also the courage of the Sfakianous: When the Turks saw that the liberation movement was gaining momentum, they decided to increase their forces in Crete. But this was an impossible task not only because of the undying spirit of the Cretan heart, but also because 'Sfakia does not recognize Turks!' The passages above are from a song about Daskalo Gianni (John the Teacher), one of the many leaders in the Cretan aspect of the rebellion. He lived in Sfakia, in Anopoli, on the mountain above Chora Sfakion. The Turks had offered a settlement to the Cretans where there would be no more deaths. Daskalo Gianni, knowing full well he was walking into a trap, went to meet the Turkish leaders. He hoped that something could be resolved, or at the very least, his death could provide a pivotal point of inspiration for the liberation of Crete. Needless to say, the Turks brutally tortured him and beat him in an attempt to extract strategic information from him. Even after they skinned him alive, he would still not betray his people to the barbaric enemy. He died of his injuries quickly. These were followed by riots which led to the declaration of Crete as an independent "Cretan State" in 1898, when a period of healing for two centuries of slavery begins.